I saw my first Mississippi Kite, Ictinia mississippiensis, in April of 2008. Of course, I was walking the dogs which made identifying any field marks near to impossible, given the distance between us and the perched bird. Yes, luckily it was perched in a dead tree that was at the edge of a small patch of woods. I would always see it at the beginning of our walks but by the time I made it home for the bins, birdie was long gone. Finally I was able to get a good view of this beautifully colored raptor. The next thrill was watching 2 of them soar and dive. I enjoyed the kites all summer long. When we returned from our trip to NY in August, I was quite dismayed to see that the kite's favorite dead tree was no longer standing! There is was again..... the big disappointment that comes from not taking time to sketch from nature when I had the chance. But, joy of joys, the kites returned again this spring and....... I saw them perched in a dead tree that I can see from my back yard!!!! Woo Hoo! 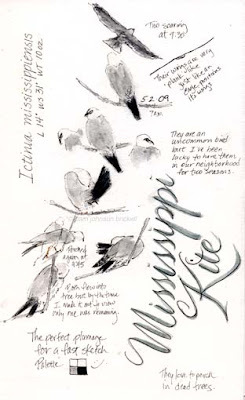 When I finished my sketches I realized that Mississippi Kites have the perfect plumage coloring a 'fast sketch' palette. David Rankin wrote a book entitled "Fast Sketching Techniques" that is filled with great ideas on how to quickly capture the essence of your subject. On page 25 he illustrates limited sketching values - just like the little square I have at the bottom my sketchbook page. White, light gray, medium gray and black. It's amazing what you can achieve with this palette. Definetely a good read!